#stampinup #faithfulinkspirations #creationstation Can you believe that it's February already?! Where does the time go? 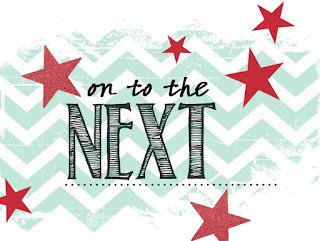 I'm so glad you've joined us for our February blog hop! The theme is LOVE and we're sharing some LOVEly projects that we hope will inspire you. Here's a shocking statement--I don't make Valentine's Day cards. Well, when the kids were young, I made cards for them to take to school. And now that the kids are away at college, I'll send them little treats. But my hubby and I don't exchange Valentine's Day cards. I guess we're not that sentimental. And, so, I don't make Valentine's Day cards. 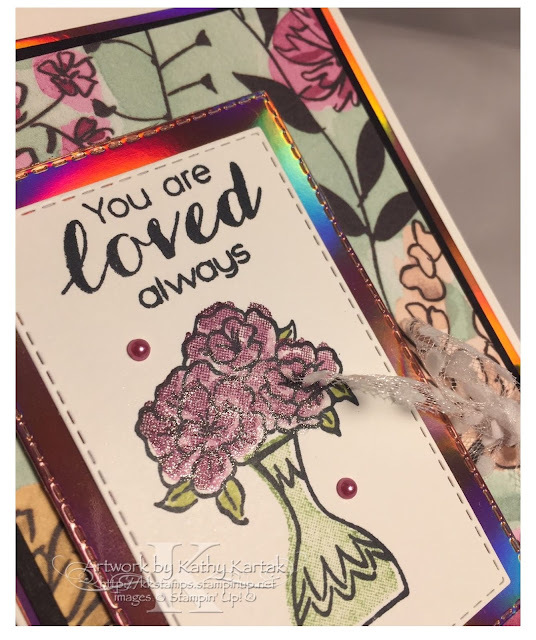 But I do like to make love notes--smaller cards that you can stick into a suitcase when someone is going off on a trip or cards you can give to someone at work to thank them for helping you out with a project or cards to tell someone how special they are. Love notes are fun to make and I think the recipients appreciate receiving love notes. So my project is a gift package of love notes. I used the Whisper White Note Cards and Envelopes (item 131527). I've made the packaging and the notes to go inside. Let's take a look. Here's the outside of the package. There are four love notes inside. 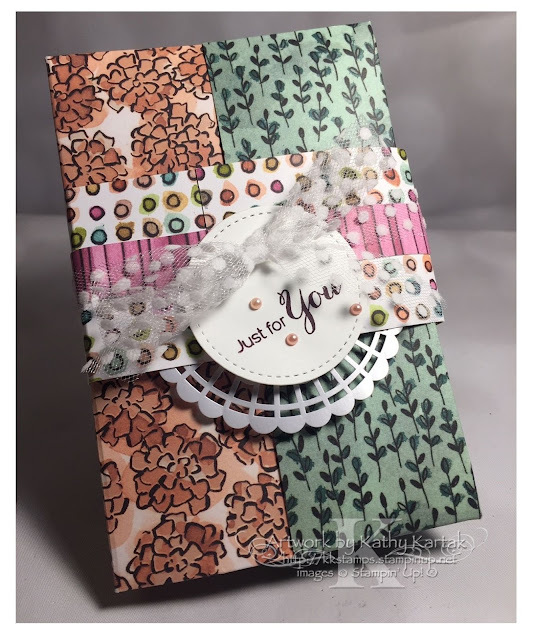 I used the gorgeous Share What You Love Specialty Designer Series Paper to make the card folder. 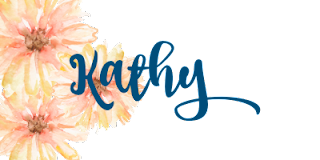 Click the tutorial tab in the banner above to see how I made this--it's super easy! I also used some Whisper White Polka Dot Tulle Ribbon and a Pearlized Doily. The little gems are the Share What You Love Artisan Pearls. You'll see more products from the Share What You Love Suite on pages 176-178 of the Annual Catalog on the cards inside the package. Here they are! 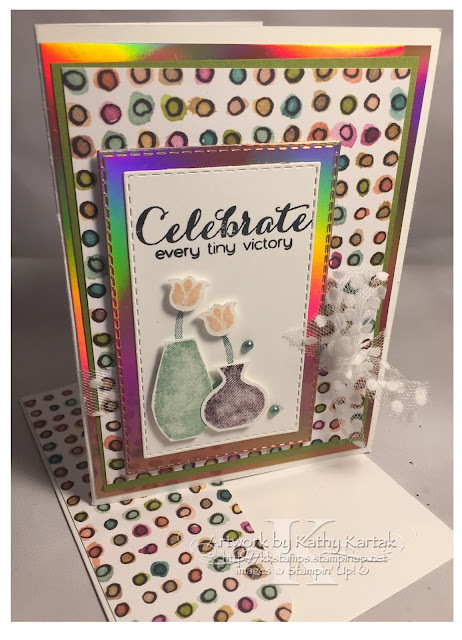 I used the new "Vibrant Vases" stamp set in the Occasions Catalog. I loved the "Varied Vases" set in the Annual Catalog and I burst forth with a squeal of delight when I saw another set that uses the Vases Builder Punch. All the cards are made from the same pattern. I started with a 3-5/8" by 4-7/8" Grapefruit Grove Foil Sheet mat--you can earn this for FREE with a qualifying purchase during Sale-a-Bration. Then I added a 3-1/4" by 4-3/4" card stock mat--two cards use Old Olive and two cards use Basic Black. Next, I added a 3-1/8" by 4-5/8" mat of Share What You Love Specialty DSP. I wrapped a length of Whisper White Polka Dot Tulle Ribbon around these pieces before adhering them to the Note Card. Next, I stamped the images from the "Vibrant Vases" stamp set in Memento Tuxedo Black Ink and used the filler stamps to add color. I cut these pieces out with a Rectangle Stitched Shapes Framelit and adhered the stamped panel to a Grapefruit Grove Foil Sheet mat that I cut with a larger sized Rectangle Stitched Shapes Framelit. PROTIP: I cut the small mat from the center of the larger Grapefruit Grove Foil Sheet before I built the layers. 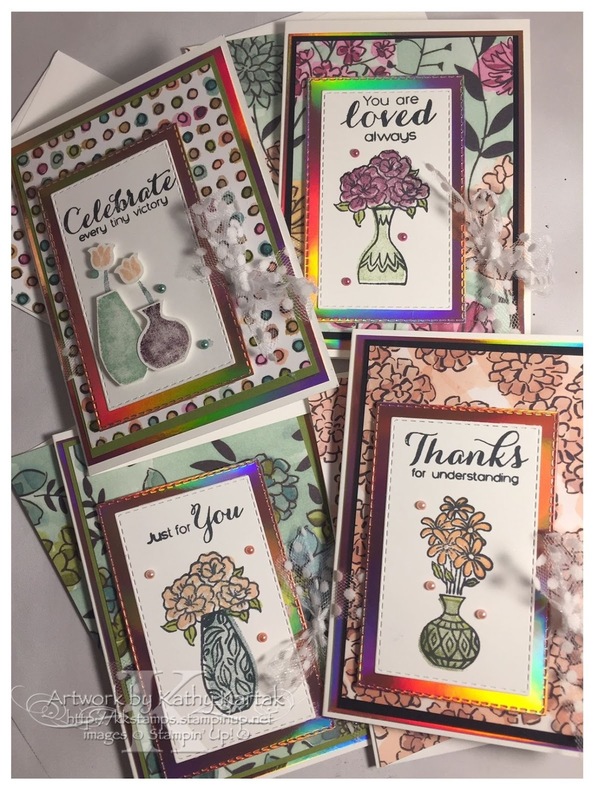 I adhered the stamped pieces to the card with Stampin' Dimensionals. 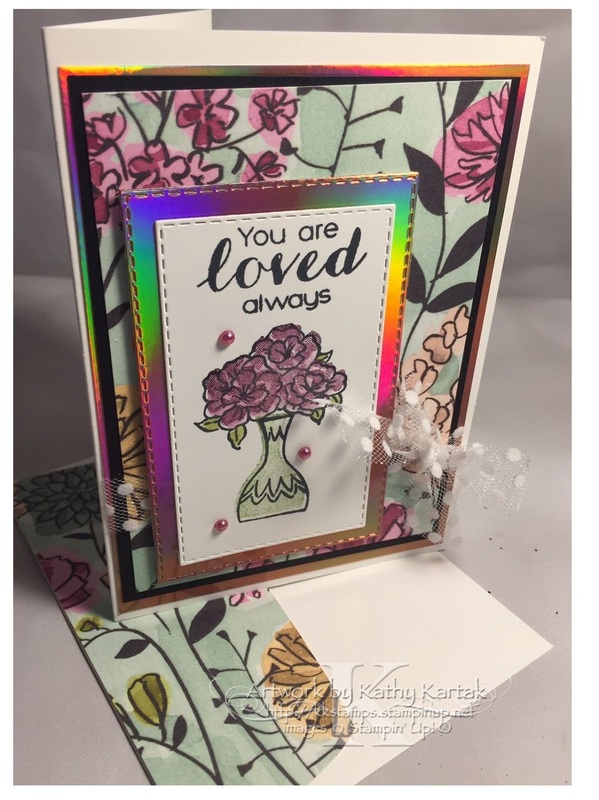 I also added three Share What You Love Artisan Pearls to each card. 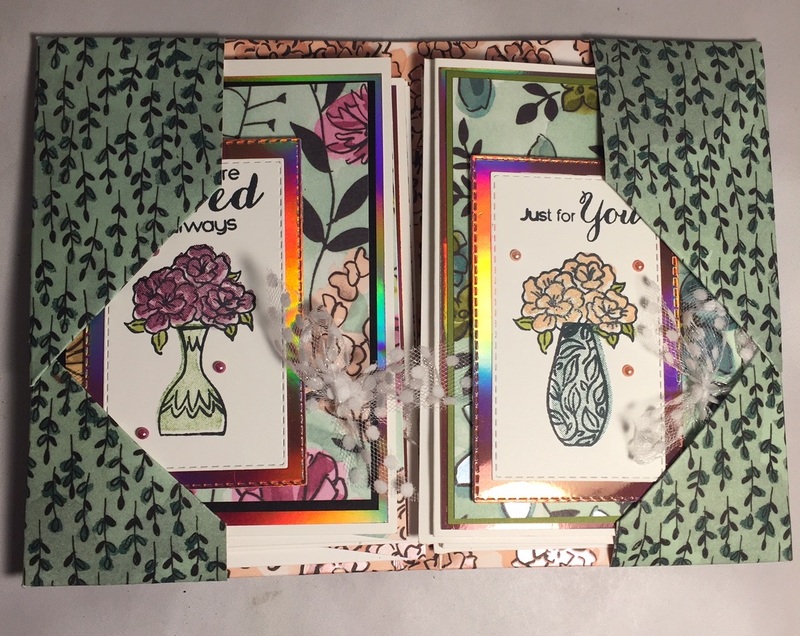 And because the Share What You Love Specialty DSP has shiny parts to it--that's what makes it "special"--I added some Clear Wink of Stella to the flowers on each card to make them sparkle and shine, too! Each card has a matching envelope--I adhered a strip of the DSP to the flap of the envelope and trimmed the excess. After I stamped all three vases from the set, I decided to use just the filler stamp and the Vases Builder Punch for the final card. 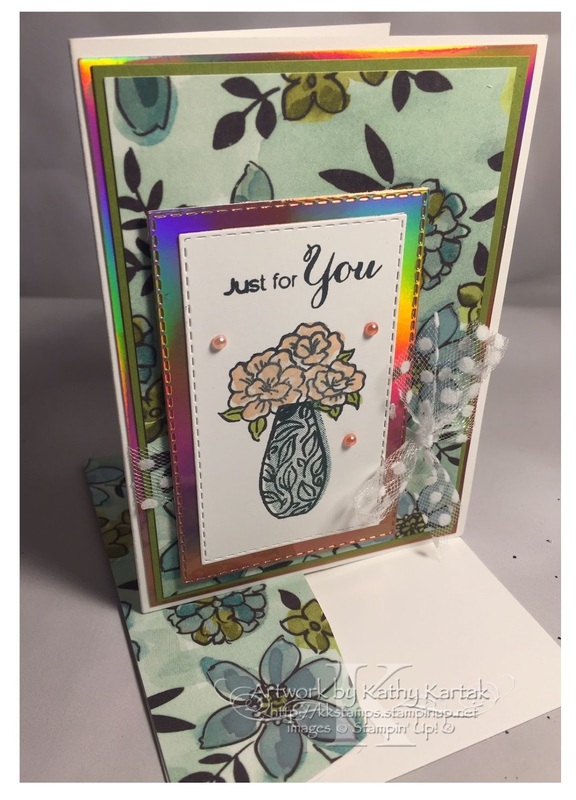 I stamped the flower stems on the Whisper White panel. The vases and tulips are adhered to the card with a combination of regular and Mini Stampin' Dimensionals. Here are the cards tucked inside the package. Don't you think this would make a LOVEly gift for someone so they could hand out love notes? Don't forget to click on the tutorial tab above so you can see how easy this little package is to make! All the products (colors, too) used for all the cards are listed below. Next up on our hop is the LOVEly Dani Dziama. I can't wait to see what she has in store for us!